In February of this year, I purchased an A. insubtilis which I later had sexed as a male. After being housed in his new enclosure, this gorgeous guy settled right in, eating immediately. He proved to be a voracious eater, quickly stalking medium-sized crickets and violently subduing them before feeding. After a couple months, he stopped eating, signaling the beginning of his premolt. My 2″ male A. insubtilis shortly after being acquired in February. Three weeks passed, and I came home to discover that he had molted while I was at work. I noticed that his exuvia was still slightly attached to his abdomen, so I moistened the area and used a cotton swab to gently remove it. After a week, he took down and ate his first pre-molt meal. Despite the slight molting difficulty, the little guy would be fine. My A. insubtilis just moments after I used a Q-tip to remove a stuck patch of Exuvia from its abdomen. While feeding some of my other Ts last week, I noticed that my male A. insubtilis was walking a little strangely. As he lifted each leg, he seemed to shake it as if something was stuck to his toes. I watched him for a bit before chalking it up to normal T behavior. The next day, it was much worse, and I realized that my poor guy was exhibiting signs of DKS, or Dyskinetic Syndrome. DKS is a series of symptoms characterized by jerky motions, loss of coordination, and an inability to eat. It most often ends in the death of the tarantula. Although no one is completely sure what causes DKS, some theories are pesticides (including flea and tick treatments for dogs and cats), micro organisms infecting the T, mold, or other toxins. I’m not sure if the molt had anything to do with his development of DKS, or whether it was other factors that caused it. I only mention it as it was something abnormal that occurred just before he started exhibiting signs. Below is a video of my poor A. insubtilis exhibiting signs of DKS. Notice the movements each time I touch the side of the enclosure. Normally, I wouldn’t mess with a T in obvious stress, but in this case, I wanted to get a short video for records and to show others. It’s not fun to watch, and it’s a bit graphic (my wife can’t stand to see it). My little guy is definitely losing the fight, and although I put him into a tarantula ICU (deli cup with moist paper towels and elevated humidity), he’s starting to slow down and curl up. I fear the “death curl” is not far behind. As I do not like watching anything suffer, I’m considering euthanizing him before it gets worse. 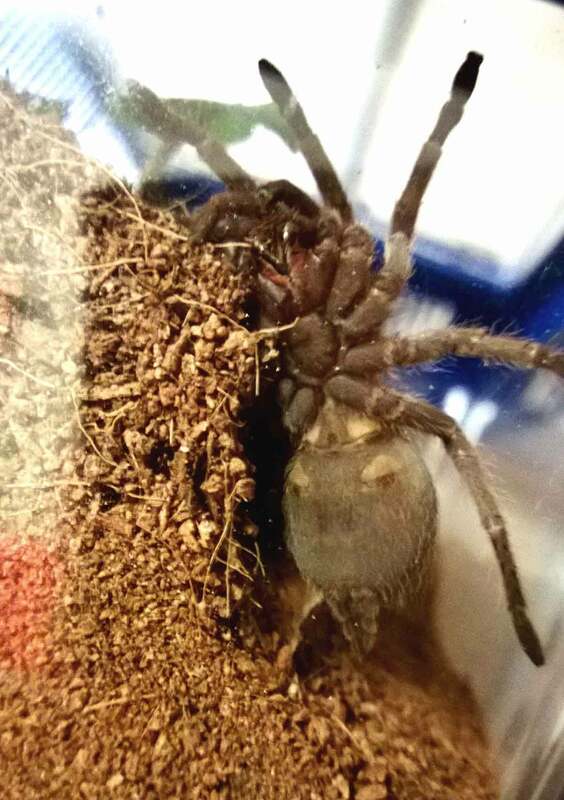 Click HERE for an an update on this T.
I nearly put one of my slings in the freezer yesterday because it had stopped eating, curled up and was displaying almost drunken behaviour when it moved. I’ve never seen DKS before but I knew. The poor little thing died during the night anyway, but I do hope that I gave it all the right care in its short life. Oh no! What kind of sling was it? After very good luck for long time, I lost a couple this winter. I recognize that tarantulas are much more fragile during their spiderling stage, and that sometimes specimens are just not fit enough to make it, but it still bothers me a great deal when I lose one. I leads me to re-evaluate how I was caring for it and to try to figure out if there was something different I could have done. I’m very sorry to hear about your two losses. Hopefully, your other two thrive and you get some healthier replacements. I had five slings. One B. albiceps (the seven legger) and four G. porteri. The friend who brought the porteri over even gave me a fresh moult from their beautiful, healthy Mum, so I know they came from a healthy, happy T. One porteri died less than 48 hours later (and I expected it to; it was quite visibly the weakest and slowest) but the others were doing just fine until now. We’ve had some very changeable weather lately, and a lot of people in the hobby here in England are reporting sudden deaths, so I do feel the weather is playng a large part. Has it gotten cold where you are? Winter time is the worst for my slings, not because of the temps, but due to the fact that the heat dries the air out to dangerous levels. This winter, the humidity level in my tarantula room would regularly dip to the teens, and I had to run a humidifier to bring it up to more t-friendly levels. My larger Ts seemed fine, but this was definitely not safe for my smaller guys. I end up using an empty acrylic cage and put an open Kritter Keeper full of water in the center. I then put all of my slings into the acrylic cage around the KK. This kept the humidity up during the winter, and prevented the water from their dishes and substrate from evaporating too quickly. I know exactly what you’re saying when nothing you do seems to help. I have a female Euathlus sp. red that has been going down hill, and nothing I’ve done to try to pull her out of it has worked. It’s very sad and frustrating. I do hope that your other guys remain happy and healthy! No, I’m here in horribly humid Chelmsford lol – I’m wishing for a really good thunderstorm to clear the air, because you could almost cut through the humidity with a knife. Sadly that doesn’t mean good moisture on this rock. I had to be away over the weekend and one of the two remaining slings is still hungry enough for beheaded mealies and pounced on one on Thursday (both are premoult and avoiding live food when they’d normally just nail it), but obviously I removed the remains before leaving on Friday. Both are alive and well, as are my adults and juvis. I truly think the slings I lost were just never going to make it; it’s a real gamble with the little guys, isn’t it. I seriously believe that DKS happens when for some reason, a tarantula is unable to moult. When I lost my a.genic to DKS last year, she was small and she hadn’t moulted for well over a year. She moulted twice while she was with me, and both times there was barely any noticeable growth, then she went about 18 months without moulting at all. Before she died, she appeared to be in pre-moult for several months before, she wasn’t eating much, and when she did want to eat, she found it very difficult to catch her prey, almost looked as if she was scared of it. About a month ago I bought another a.genic and she was slightly smaller than the one I lost when she died. Well, she moulted this morning and I’m amazed that she’s literally doubled in size. I know this species is a fast grower and I can’t help thinking that this was a factor in the death of my old genic, she just never grew in the 2 and a half years and 2 moults that I had her. I think she died because she had grown, maybe too much, maybe to compensate for the lack of growth in her previous two moults, and was literally trapped and squashed inside her own exoskeleton. 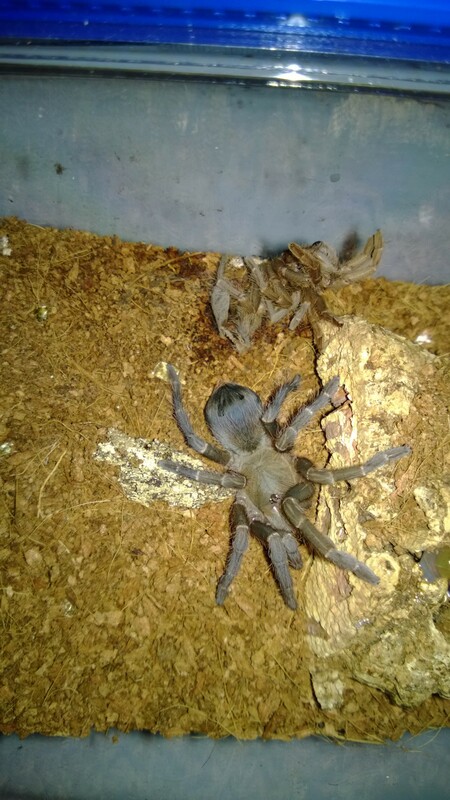 I’m very sorry to hear about your T. 😦 Did your A. geniculata exhibit DKS symptoms before she passed? Currently, no one is quite sure what causes these symptoms, and the suspected culprits are numerous. When a spider is showing signs of DKS, it’s the result of some underlying cause. Think of it like a bad headache. In this scenario, the headache could be caused by migraines, a concussion, a tumor, or a hangover. In this instance, the “headache” is a symptom of something else and the possible causes are numerous. DKS, at the moment, is the same way. People have observed a tarantula showing DKS after a bad molt, being subjected to extreme heat or cold (happens during shipping), or being exposed to chemicals or pesticides. In my instance, my insubtilis had JUST molted and had even eaten a couple times before it showed the symptoms, so it wasn’t stuck in a molt. However, molting problems have often been cited as one of the precursors for it, so it’s likely that something halted that process in your T and eventually led to its demise. Unfortunately, sometimes spiders just die, even if they appear healthy and have been eating and molting regularly. How large is your new genic compared to the old one? Are they they same size? Species make different size jumps depending on their what part of their life cycle they are in. For example, my Phormictopus cancerides make amazing size jumps as slings and juveniles. However, as young adults, the jump in size between molts isn’t as profound. Also, males of a species may grow faster than the females. Just something to think about. Hi Tom. Yes she did exhibit signs of DKS before she died. When I look back, I think that there was something not right about her in all the time that she was with me. She used to hide away all the time when this particular species is well known to be a great display spider. She always found it difficult to catch her prey, never seemed to be quick enough. Then about a week before she died, I noticed that she kept twitching her legs as if something was irritating her. Things went downhill rapidly from there until it was obvious that something was very wrong. She would stagger around the enclosure as if she was drunk, her legs were flailing around as if she had no control over them at all, it was really quite pitiful to watch. She lasted for about 3 days like that and I did everything I could to save her. I raised the temperature into the low 80’s and the humidity in the hopes that I could help her to moult out of it. She did raise my hopes when she flipped over on her back, but 12 hours later, her legs started to curl up and I knew that was going to lose her battle. I dropped water into her mouth with a pipette, but nothing I could do was going to save her and her response got slower and slower until she died. It was the first T that I lost and I was devastated. My new Genic was slightly smaller than the old one was when she died, but like I said, this new one has more than doubled in size since it moulted yesterday. I say “it” now because I suspect it could be a male now. It’s two front legs are very long which I believe is a sign that it’s a male? I can’t see any tibial hooks, but I don’t think it’s mature enough for those yet. I don’t know what the life span of a male Genic is, but I don’t think it’s very long unfortunately. Well, I’m really very sorry to hear about your loss. Having watched one of mine go through it, I know how horrible it can be. And it sure sounds like you did absolutely all you could do to save her. What a shame. You are likely right in that the spider just wasn’t right all along. Unfortunately, some of them just aren’t fit enough to survive, and tarantulas can die for no apparent reason. It sounds like you have a good, healthy one now, at least, which is fantastic. Sometimes folks that lose a spider are afraid to get the same species again. Males will often grow faster than their female sac mates (some theorize it’s so they’ll mature earlier and prevent inbreeding) but they usually don’t become more leggy until their last molts. How long is this one now? If you don’t power feed them, and if they are kept in the lower end of the temperature range, they can last a few years. I would say the leg span is about 4 inches when stretched out, but it’s nowhere near being an adult as the carapace is still only about a centimetre in size, it’s all legs and no body at the moment as the abdomen is quite small since the moult. I’ve just given it a first cricket since the moult which it was happy to receive, the cricket didn’t even hit the substrate before it was caught. Hi, i’m rio from Indonesia. Could you tell me how did you euthanizing your T? My B.Hamorii also suffer symtomps like DKS. I’m so sorry for the delay (and to hear that your T has DKS). You can freeze them. It’s the most humane way.